Ohhh I'm feeling so guilty that I'm showing you this two months after I received it! I totally forgot to post it but when I was searching for a new blogpost I came across this picture. You remember the Valentine's post about the Zalando mail man? Well this was my second present after the rose. I went for a weekend bag which I use for traveling between my house and my boyfriends. Before I used a sport bag .. yeah not cool at all. I wanted a bag that would match my outfit and looks fashionable. I saw this one from DAY birger et mikkelsen and was imidiately sold. How cool is my new weekend bag!? And it's even incredible how many stuff fits inside. 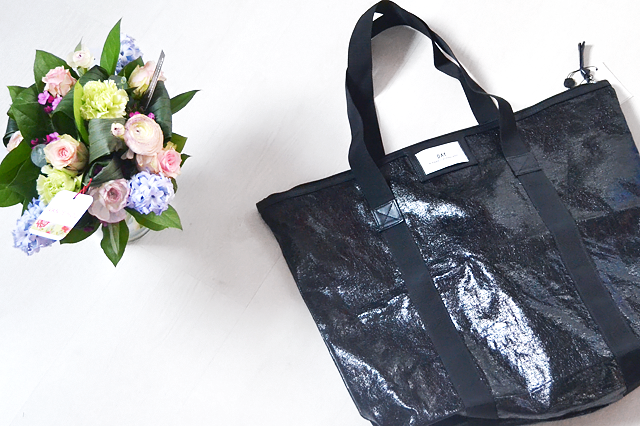 Inderdaad een leuke weekend bag!